PRESS: Wendy W Fok was interviewed and featured on the Core77 article regarding how she incentivized her Parsons School of Design Creatives and Entrepreneurship students in using crowdsourcing platforms for their design projects. Read more here – Core77. LECTURE: Wendy W Fok of WE-DESIGNS is invited to present at the Paris Design Summit 2019. The Paris Design Summit answers a call for action spurred by the Montréal International Design Declaration signed in October 2017 by nearly 20 international design, architecture & planning associations. Initiating the beginning of a 12-year program, major international, national and local actors in the design, architecture & urban planning domains, will forge links with international, national and local actors outside the design domain to create a practical framework for sustainable design, with the help of the world sustainable design framework secretariat organization, a non-for profit organization structuring the conversation with international leaders and influencers of our time. The main objective of the various actors bringing this initiative to life, is the actual realization of a number of projects empowering the international design community over the next 12 years and after, in relationship and aligned with the private sector and governments intentions, as well as the United Nations’ 17 Sustainable Development Goals, helping creating a more sustainable, inclusive, equitable and livable world for all. LECTURE: Wendy W Fok of WE-DESIGNS is invited to present at the Toronto Design Festival as part of the DesignTO Symposium: Unlocking the Future of Work. DesignTO fourth annual symposium brings 10 multidisciplinary experts into one room for an inspiring discussion on the Future of Work. The event features five thematic sessions on topics like meaningful work, inclusion and diversity, work space, and economic systems and ethics. EXHIBITION: WE-DESIGNS is honored to be commissioned, Hyper-Density vs Public-Privacy, invited by Shin Wong, Lead Curator of the PMQ deTour 2018 as one of seven exhibitors at the deTour 2018 exhibition series. The tenth edition of deTour will explore the theme, Trial and Error, contemplating one’s creation process before achieving the best results. Creativity is allowing yourself to make mistakes. Art is knowing which one to keep. Recollecting those excellent creative works in history, we can see that they were not only defined by the creators’ aesthetic sense, but also the ability of persevering their vision, knowing what people want and uplifting our needs, which are all important elements under the umbrella of design thinking. Each year, deTour aspires to delve deeper into the thinking process of creation. Many works have taken hundreds of trials, some even thousands, we are curious how one thinks during the course of artistic practice and to what extent they can judge the final work as the best amongst all possibilities. Through exhibitions, installations, workshops and design talks, we are keen to unearth and demonstrate innovative experimentation, original thinking and invite general public to join us in discussing what makes a good design. Urban Design Forum Building an equitable economy in New York City requires a groundbreaking approach to urban design. The Urban Design Forum is an independent membership organization that advances bold solutions to urban challenges. Our Fellows are architects, landscape architects, planners, developers, public officials, scholars, activists, lawyers and journalists committed to building dynamic, equitable, and resilient cities around the world. For nearly 40 years, the Urban Design Forum has shaped the conversation around the future of New York City and cities around the world. Through conferences, publications, and its network of Fellows, the Forum brings together leaders in the field of urban planning and design and energizes creative approaches to urban issues. LECTURE: Wendy W Fok of WE-DESIGNS is honored to be invited by Prof Neil Ramsey to speak at FIU, in Miami Florida, as part of the FIU Ratcliffe Art + Design Talk Series on the process of creative entrepreneurship. Ratcliffe Art + Design Incubator is an initiative aimed to promote and foster social entrepreneurship and innovation amongst upcoming FIU artists and designers. The incubator’s one-year residency will provide Ratcliffe fellows with essentials tools to turn their ideas into profitable businesses. CONFERENCE: WE-DESIGNS designed, organized, branded the Redefining Luxury Conference. Wendy W Fok is the lead faculty of the Redefining Luxury Conference and Initiative at Parsons School of Design. Redefining Luxury Initiative at Parsons School of Design, led by faculty and students in the School of Design Strategies and the School of Fashion, hosts a series of conferences, workshops, and events throughout the year that provocatively discuss and challenge the definition, relevancy, and future of luxury. EXHIBITION: WE-DESIGNS is the official design team behind the Hong Kong Pavilion, at the London Design Biennale 2018. For the London Design Biennale 2018 theme ‘Emotional States’, our team will be designing the experience, production, and design-build of the Hong Kong Pavilion. ‘Sensorial Estates’, focuses on the sensory experience of smell and its relationship with nostalgia and memory in the context of everyday life. The research and development of this installation explore the sensorial representation of Hong Kong through an interactive, sensorial, physical, and tactile installation. It will aim showcase emblematic cultural icons and experiences, and capture local influences through site-specific objects and designs — representing the locality, regionality, and complexity of Hong Kong. TEAM: WE-DESIGNS is super excited to welcome, Kristina Soriano Jacobs, as our head of communications. Kristina brings over a decade experience in the world of public relations, in fashion, beauty, and client relations. She will be working closely with the larger goals of WE-DESIGNS to deliver creative partnerships, and beyond. We welcome Kristina to our team! LECTURE: Wendy W Fok of WE-DESIGNS will speaking at the IaaC Digitize Global Summer School. New Lab at the Brooklyn Navy Yard, Brooklyn, NY. Our bodies are complex systems that are dynamic and kinetic, allowing us to navigate through the world, experience our surroundings, and communicate with others through sensing and feedback. In order to understand our surrounding environment, we rely on ours senses; sight, hearing, touch, taste, and smell. New York City is a unique environment, layered with cultural diversity, historical attributes, architectural typologies, public spaces, and landscape ecologies that coalesce to form a dense urban network. Walking around New York City, one experiences many different environments formed by visual information, sounds, smells, and textures. The NYC IaaC GSS node invites applicants from various fields and backgrounds who share a common interest in design processes that involve making, tinkering, hacking, coding, data collection, 3D scanning, digital fabrication, and working with physical computing technologies to explore new possibilities for wearable body architectures that evolve human-machine-environment interactions. EVENT: Wendy W Fok of WE-DESIGNS will be a mentor and speaker at the Tech Jobs Tour in New York. Please be our special guest and join us for an Invite-Only Reception during our Tech Jobs Tour NY event on June 19th! June 19th, 5-6pm, RSVP here. The Tour is an initiative to help connect diverse and non-traditional talent to open jobs across the country in 25 cities and beyond. Last year we traveled to 25 cities and connected with over 40,000 attendees and brought over 115 hiring partners to the room. Breanna Kuhl, VP of Partner Success at GE Digital, and many more! Content Highlights: We are excited to debut our #EdTech track with partners, Grow with Google and Girl Develop It! Content will also include a range of lightning talks, a coding bootcamp showcase, speed mentoring sessions connecting mid-level/senior level talent with up-and-coming techies, a career fair, and of course, special guests. PANEL: Wendy W Fok of WE-DESIGNS will be part of a panel discussion to kick-off the upcoming Young Guns YG16 awards this year with fellow YG past winners. SO YOU WANNA BE A YOUNG GUN? What does it take to join the ranks of Young Guns winners? Please join us on Thursday, May 31 for a speaker panel of past Young Guns winners who will share their backstories, their own early career challenges, and their own thoughts on what clicked within them to allow them to win. They’ll talk about which Young Guns they themselves looked up to, and the guidance they received from them. And of course, they’ll share what being a Young Guns winner has meant for them, their careers and their creative network. Wendy is one of six Asian representations on the jury, as featured on Branding Asia. She won the award for YG11, and will be along the side of New York locals such as with Jessica Walsh (YG8) of Sagmeister and Walsh, and several hand-picked individuals to judge this year’s competition. EXHIBITION: Our research and design work will be part of the collateral exhibitions at the 16th International Architecture Exhibition, as part of La Biennale di Venezia, Architecttura 2018. Modes of perceiving, experiencing and inhabiting cities are radically changing along with a radical transformation of the tools that we use to design. Cities, buildings, bodies are complex and systemic organisms requiring approaches that engage new multi-scalar strategies to connect the physical layer with the system of networked ecologies. Over the past two decades, we have witnessed a series of projects with an interest in shaping architectural form coining terms such as ‘datascapes’ (1), and more recently, ‘atmospheric thinking’ (2). In these projects, computational technologies inform new relationships between information and matter, code and space to redefine new urban ecosystems where light, temperature, humidity, and biometric data are pre-conditions for spatial form. PRESENTATION: The future of cities is now; and the people powering that future live and work in cities, bringing their energy and ideas to bear on the unique challenges and opportunities of urban life. We will be hosting the “Fabricating the Future: Makers in the Shared Economy” panel on May 8th at 3pm. Wendy W Fok will be moderating a panel discussion with leading directors of the A/D/O, NEW inc., The Brooklyn Navy Yard, New Lab, and the Making Center of the Newschool. This year, we are proud to announce a partnership with Smart Cities New York (May 8-10, NY), where a diverse global community of leaders from business, government, academia, civil society, and startups will explore the emerging power of cities on the world stage. How can technology transform the lives of citizens? What drives innovation? Where will ideas and expertise rise from next? Who will lead the movement for better, safer, smarter cities? As our colleague, we invite you to join us on this incredible journey. Visit the website for the latest on the #SCNY18 program including: high profile speaker announcements, workshops, and keynotes to attend, Receive a 25% discount on tickets purchased before here with code: SPRING2018. PRESENTATION: Wendy W Fok is invited to present at the Design, Justice, and Zero Waste, Exploring Pathways to the Circular Economy at The New School on May 8, 2018 at 10:30 AM – 11:30 AM. She will be sharing her research and discussion on “Democratising Housing Sharing Economy“, within the “New Economies” panel. Please be sure to register for the conference via Eventbrite. Additional information about travel and accommodations can be found on the conference website. Frontline communities and workers in waste, manufacturing and distribution face disproportionate impacts from environmental degradation and extractive and exploitative industry practices. The conference will focus on how issues of production, consumption and waste impact environmental justice communities, workers and vulnerable populations. By advancing a circular economy, we can reduce often-overlooked sources of significant greenhouse gas (GHG) emissions, such as those from the supply chain of the manufacturing sector. Reducing consumer and industrial waste will be instrumental in lowering national GHG emissions and could help state and local governments meet emission targets set by the Paris Climate Accords. PANEL: Wendy W Fok will be part of the 34th National Conference on the Beginning Design Student Conference (NCDBS), moderated by Mara Marcu. The 34th National Conference on the Beginning Design Student will be held March 1-3, 2018 at the College of Design, Architecture, Art, and Planning at the University of Cincinnati. The theme of the 2018 conference is TIME. The conference, to be held at the College of Design, Architecture, Art, and Planning at the University of Cincinnati, will focus on the ways in which the PAST, PRESENT and FUTURE are considered and engaged in beginning design education. PRESENTATION: Wendy W Fok and the team will be part of the Make/Model event hosted by NEW inc and A/D/O. MAKE/MODEL is a hackathon-style event focused on giving participants a hands-on glimpse into the design and manufacturing process, taking place in Greenpoint, Brooklyn, February 2-4, 2018. Co-developed by NEW INC and A/D/O, and part of a greater Futureworks and NYCEDC initiative to support design, fabrication, and advanced manufacturing in New York City. The event will bring together 100 participants to prototype projects and develop ideas together around the theme of Future Urban Living. Imagining what life will look like in the city of the future, we will look at how it will impact various aspects of everyday urban life — such as transportation, housing, sustainability, and shared resources — as well as how these situations will affect different communities. Our goal is to uncover and celebrate creative approaches and design solutions that address these challenges today and in the future, with a particular focus on design solutions developed by and for the communities most likely to be adversely impacted by ongoing changes to our cities. PANEL: Paul Amitai has invited Wendy W Fok to be part of the upcoming, “Subject, Object: Making in NYC”, along with Arielle Assouline-Lichten (Slash Projects), Ryan Luke Johns (GREYSHED), Madison Maxey (Loomia), Wes Rozen (SITU Studio), and more to be announced. The panel is for GSAPP students and faculty, but are also free and open to the broader Columbia community and general public. Please join us if you are in the area. PANEL: Invited by Eric Verkerke, co-founder and Chief Creative Officer of Emergence (Creative for the Common Good), Wendy W Fok of WE-DESIGNS will be part of the Smart Cities New York December Town Hall on Thursday December 7th, highlighting the topic of “The intersection of architecture, design, technology and theory for urban environments”. Please join us if you are in the area. PRESENTATION: Wendy W Fok of WE-DESIGNS is invited by the IIDEXCanada 2017, to speak on “Design Manufacturing Through Pop-Ups and Temporary Structures – Seminar #T35”. Please swing by, the Buildings Show and IIDEX Canada is known as North America’s largest annual exposition, networking and educational event for design, architecture, construction and real estate. EXHIBITION: the WE-DESIGNS team is invited to exhibit “#WhoIsUnknown“, a culturally driven, network and social media questioning, digital and physical experience-based installation, at the London Design Fair, as part of the London Design Week. Swing by the Old Truman Brewery. For more information, click here. EDUCATION: Wendy W Fok is invited by Parsons Paris to teach the exciting Introduction to Design Management. Where her students will have the opportunity to visit the Fondation Louis Vuitton, Dior’s Montaigne boutique and the Salons Haute Couture, Paris Fashion Week related events, and speak with key individuals within the business of design. Parsons School of Design faculty Wendy Fok leads participants on a journey that will inspire innovative approaches to the design of systems, services, and businesses. Participants will together discuss the challenges and opportunities inherent in creating products, systems, and services that are socially, environmentally, and economically sustainable, and explore the many processes and tools available for creative problem solving through prototyping. This workshop is crafted to respond to the diversity of models for practice within art and design fields, business models both conventional and alternative, and provide relevant takeaways to leaders in a variety of fields. As an architect, creative director, founder, and artist, Fok has been summoning the powers of cross-pollination and creative strategy in both her professional and personal work for decades and is looking forward to hosting you in The New School’s top-of-the-line Parsons Making Center. EXHIBITION: WE-DESIGNS and the Resilient Modular Systems team will be exhibiting at the Tech+ Expo this May 23, 2017, as part of the NYC x DESIGN. Tech+ presents cutting-edge products that range from virtual reality-aided design tools, mobile apps, and software platforms to rapid prototyping and fabrication. Come see the latest in smart building systems, advanced materials, networked sensors, and innovative products that help designers create the spaces of the future. PRESS: Wendy W Fok is featured on the new Omni-channel #MakeEveryday #Original campaign with SKYY Vodka / Campari Group, shot by Tony Kelly. Features include OOH media distribution in Time Square, various national markets, and through digital media distribution. More information could be found through SKYY Vodka and Instagram. CONFERENCE: Wendy W Fok is invited to speak at the “Material Interactions – A Symposium Focused on the Current and Future Impacts of Sensing, Actuation, and Robotic, Technologies in Design”. A Symposium hosted by, The Bernard and Anne Spitzer School of Architecture, The City College of New York. PANEL: As part of the SXSW Interactive 2017, Wendy W Fok will be speaking at the “Crossover of the Future in Art x Tech by Women in Design” panel. The Panel will probe into the curiosities of the world of technology driven by the perspectives of players, Anouk Wipprecht, Behnaz Farahi, Tiffany Trenda, and Wendy W Fok. As women with various backgrounds of fashion wearable, industrial design, spatial design, experience design, and architecture. Looking into the gradients of the question of spatial and intelligent futures, the panel highlights and promotes the discussion of Women in contemporary world of tech and design, art and engineering, and how technology interacts and intersects with the built world. CONFERENCE: Wendy W Fok will be part of the “Discussion Forum – Representation and Media (RWU)”, invited by Prof Anthony Piermarini, Program Director for Beginning Studies in Architecture at Roger Williams University. The goal for the Forum is to discuss the relationships between Representation and Digital Media and the Studio Design Curriculum. PUBLICATION: Wendy W Fok is included as part of the “SHANGHAI TEN FOLIO” book, published by ORO. Edited by Tom Verebes. SHANGHAI TEN is the product of a multi-contributor collaboration, comprised as the composite aggregation from a large design community. Contributions to this book have been selected from the work of 745 students from 44 countries who have joined AAVS Shanghai from 2007-2016; 36 tutors who have taught in the programme; and over 80 visitors to the programme. In addition, SHANGHAI TEN | FOLIO also includes essay contributions from a range of expertise in urbanism; transcribed conversations from AAVS symposia in 2015 and 2016. NEW OFFICE: WE-DESIGNS is happy to have moved into our new home at 231 Bowery, as part of the NEW Inc. co-hort. Looking forward to some exciting #crossovers and #collaborations. Feel free to reach out. WE are ecstatic. KICK-OFF: Featured on WIRED, our team at WE-DESIGNS is very excited to be #making with WIRED x SKYY Vodka x Plated on the crossover #FutureProof project. #Lit #designs to come within the next few months, with an amazing team and players, Nick Taranto and Noah Norman. EXHIBITION: Invited and curated by Tom Verebes, our work will be exhibited at the AAVS SHANGHAI TEN | SHOW | EVENT Architectural Association Visiting School, amongst other world-renowned architects, urbanists, and designers. A published exhibition catalogue and symposium with speakers such as Plasma Studio, UN Studio, Synthesis Studio, Zaha Hadid Architects, among others will be part of the show. PUBLICATION: Forbes publishes recent article on “Intellectual Property In The Age Of Open Sourcing: Who Owns It, And How Do They Get Paid?” by Wendy W Fok. CONFERENCE: Wendy W Fok presented at the ACSA International Conference 2016 in Santiago Chile, along the side of Keynote Alejandro Aravena, on the topic of “The Internet Of Things: Making Cities — And The Way They Use Technology — Smarter“, based on the on-going research of a topic that has been written on Forbes. DESIGN BUILD: AutoDesk, Pier 9, Instructables, and Wendy W Fok will be collaborating on an innovative and automation project, based on the continued research and development of the Public Benefits Corporation, Resilient Modular Systems. This innovative creative and design project will question the use of automated technology for the modular construction and built environment, and the future of work and labor. FINAL REVIEW: Thank you Raveevarn Choksombatchai for inviting Wendy W Fok to your student’s eclectic array of Thesis projects at UC Berkeley. Pleasure to be with other playfully and intellectually engaging critiques, such as: Ellie Abrons (University of Michigan), Filip Tejchman, Roddy Creedon, Danielle Guthrie, Zoe Prillinger, Andrew Atwood, and Richard Hindle. FINAL REVIEW: Thank you Andrew Kudless for inviting Wendy W Fok as a guest critic to your amazing final review at the California College of Arts, Architecture and Digital Craft Lab. Super relevant discussion on the issues of automation and architecture. Along with other esteemed colleagues such as June Grant, Jonathan Massey, Ron Rael (Emerging Objets), Aaron Willette (Apple), Georgeen Theodore (Interboro), among many others. PUBLIC ART WORKSHOP: Ethan Vogt (Director of Planning at ILLUMINUS / Nuit Blanche HUBWeek of Boston), Jutta Friedrichs (Curator of ILLUMINUS, MDes 2012), and Wendy W Fok will be running a Public Art Lab Workshop at Harvard GSD during J Term. The course “Public Art Lab: curating, permitting, and producing ephemeral civic interventions (INT 0002100)”, will explore the initiatives between design, production, and realization, with invitations to key figures of the City of Boston, and various perspectives from City Planners and Chief Directors of Arts to present their perspectives on creating cities that are enliven by public art. FINAL REVIEWS: We are honored and thankful to have been invited to the Final Design Reviews of: Prof Michael Sorkin, at The Bernard and Anne Spitzer School of Architecture of the City University of New York; Prof Jeff Inaba, at the GSAPP of Columbia University; and Prof Daekwon Park, at the School of Architecture of Syracuse University. AWARD: Wendy W Fok is very grateful to be one of the six finalists for the second IVY Design Innovator Awards, presented by Cadillac and Wired Magazine. Finalist award was presented by Christian Siriano at the New York Affirmation Arts Center. EXHIBITION: Wendy W Fok and her team at WE-DESIGNS is invited to be part of a group exhibition at the Reed Gallery, in Cincinnati, Ohio, as part of the Eco-Diversity show for ACADIA 2015: Computational Ecologies. Our team worked hard on producing this piece of Public Art and experiential installation, and are super thankful to have worked with such amazing curators (Mara Marcu, Stephen Slaughter, and Ming Tang), and the gallery Director (Aaron Cowan). CONFERENCE: Wendy W Fok is invited to be a moderator at the 2015 ACSA Fall Conference: Between the Autonomous & Contingent Object, at Syracuse University, School of Architecture. The topic of debate will be “In the Digital Age of Architecture, Internet of Things (IoT) and Open Innovation (OI) are the future systems of the Architectural Object“. 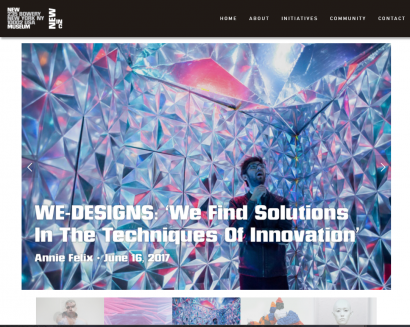 PUBLIC ART: Wendy W Fok and her team at WE-DESIGNS is selected to design an interactive Public Art installation for the Illumnius Boston Nuit Blanche, part of the Boston Innovation HUBWeek. The piece will be installed on Lansdowne Street, right next to Fenway Park. We are very excited on this exciting opportunity to work with such amazing curators, like Jutta Friedrichs. TALK / PRESENTATION: Wendy W Fok is invited as a speaker at the Library of Congress, as the inaugural Digital Kluge Fellow, at 4pm, on August 13, 2015 at the Pickford Theater. Her talk will be on the “Intangible Information Costs of Real and Digital Property: Ethical / equitable means of ownership and authorship in architecture and design”. This is a public lecture at the Pickford Theater | Library of Congress, please join us if you are in the Washington, DC area. Kluge Fellow in Digital Studies Wendy W. Fok investigates computational innovation and ethical/equitable application of technical methods, including issues of intellectual property law, ownership and authorship property rights in digital fabrication and commodisation, for architecture and the built environment. Her talk addresses the intersection of digital technology (especially in the realm of architecture), law, and the rapid advances in these fields that are creating areas of conflict. SEMI-FINALIST: Our team is very thankful to be a Semi-Finalist for the project, Resilient Modular Systems – RMS, where we developed the product and provided creative direction for the Think Beyond Plastic Competition – Semi-Finalist 2015. Semi-Finalist for Resilient Modular Systems [RMS], Public Benefits Corporation. TALK / PRESENTATION: Wendy W Fok is invited as a speaker of the Celebration of 15 Years of Extraordinary Scholarship at the U.S. Library of Congress, in Washington, DC. The June 10 Gala and June 11 celebration is part of the Scholar Fest at the Kluge Center, and includes a wide variety of prize-winning scholars, academics, and political speakers at the event. TALK / PRESENTATION: Wendy W Fok is invited as one of the featured speakers at the SEGD (Society of Experiential Graphic Design) Annual Conference in Chicago, between June 4 – 7. Feel free to view the press feature and preview of the talk here. CONFERENCE: Harvard Graduate School of Design – Data Across Scales Conference. As a co-chair, Wendy W Fok moderated the “Open Data / Civic Media” Panel, and invited Keynote Mario Carpo. Would like to applaud the opportunity to have worked with such an amazing team: Joëlle Bitton / Jose Luis GarcíadelCastillo / Felix Raspall. Click here to learn more about the Conference. WORKSHOP: Wendy W Fok is invited to the SXSW Interactive this year in Austin, between March 13 – 17 2015, to continue the Making the Future 3D printing workshop series. Register early to get your badge to SXSW. EXHIBITION: Our recently designed exhibition “Learning to Build: Resilient Modular Systems – a Public Benefits Corporation“, for our B-Corp venture, Resilient Modular Systems – RMS is currently on display and featured at the Harvard Graduate School of Design. The exhibition is also part of the official poster designed by Bruce Mau Design for the Harvard GSD Spring 2015 exhibition and lecture series. PUBLICATION: Wendy W Fok recently authored and published an article, “Ownership in the Digital Age” in the “Ethics” issue for Pidgin Magazine, edited By Melissa J. Frost, Van Kluytenaar, José Meza, Gina Morrow, Nicholas Risteen, published by the Princeton School of Architecture. Grab your own copy today at Printed Matter in New York. PRESENTATION / WORKSHOP: Wendy W Fok is invited to speak at the IIDEX Canada PechaKucha Keynote Stage, and give “Making the Future” a 3D printing Workshop, along with Evelyn Tilney and Natalie Rodriguez-Goris. INVITED JURY: We are honored to join our colleagues from Asymptote Architecture, Atelier Manferdini, Francis Bitonti Studio, SynthesisDNA and WE-DESIGNS, LLC on the jury for the IIDEX Canada Virtual Spaces design competition. Enter here! Together with ArchDaily and Invent Dev Inc., IIDEXCanada launches a virtual reality exhibition and competition that invites architects and designers to submit 3-D renderings of unbuilt or fantasy projects. Winning projects will be developed into a virtual reality exhibition for the 2015 show. — with Alvin Huang, Elena Manferdini, Francis Bitonti, Hani Rashid, and Wendy W Fok. PUBLICATION: Thank you, LINKS for publishing over six of our projects between “Digital Architecture: New Applications” and “Digital Architecture: New Approaches” within your new publication. We are honored to be published along the side of our esteemed colleagues, such as Alvin Huang, Elena Manferdini, Joe MacDonald, Skylar Tibbits, Tobias Klein, Gage Clemenceau, davidclovers, et al. TALK / PRESENTATION: Wendy W Fok is invited to speak at the “ADC Creative Journeys” at the Apple Store in Boston (815 Boylston Street), with Chaki Ng (SVP of Products, VIACOM, MTV, +VH1 Digital), to discuss their careers, what inspires them, and how they got to where they are today. Register here at Apple. INTERVIEW / PRESS: Wendy W Fok featured on an interview by Ben Schiller, on Fast Company’s Co.Exist on the recently established Public Benefits Corporation, Resilient Modular Systems. Read More on: “3-D Printed Plastic Could Replace Not-Very-Good Corrugated Iron Roofs In The Developing World”. FELLOWSHIP: Wendy W Fok is honoured to become the inaugural Digital Kluge Fellow awarded by the Library of Congress, where she will continue her research on the ethical and equitable use of computational innovation and technologies for architecture and design, probing into the issues of policy, economics, and legal provocations in the field of digital design. PUBLICATION: HKSZ 2011 curators, Gene King and Anderson Lee, and the HKIA committee, recently published our installation, TETRA V.2, in their most recent “Learning from Tri-ciprocol Cities” book, published by OBO Editions. RESEARCH: As part of the Digital Problem Solving Initiative (DPSI) lead by the Berkman Center of Internet and Society, Harvard Law School, Wendy W Fok has been leading the discussions for the Open Access Project, under mentors Peter Suber and Colin Lukens (Office of Scholarly Communication) , to further engage the Harvard University community into implementing active protocols to streamline the Digital Access to Scholarship at Harvard (DASH) for faculty and scholars, with published materials. FINALIST: Wendy W Fok was invited to present her research and was nominated by the eCAADe committee for the Ivan Petrovic Prize, as a young researcher (under 35 of age) in computational technologies. Keynotes included: Christian Derix / Stephen Lockley / Andrew Hudson-Smith, and panelists of Robert Aish, among others., in Newcastle, UK. CONFERENCE: Wendy W Fok was invited to present her research and participate on a panel discussion for the “What’s the Matter: Materiality and Materialism at the Age of Computation” International Conference at the COAC and ETSAB. Keynotes included: Bob Sheil, Philippe Morel, Mario Carpo, Manuel DeLanda, Alisa Andrasek, among others, in Barcelona, Spain. SHORTLIST: Geo-Cognition and Resilient Modular Systems [RMS] by WE-DESIGNS was shortlisted for the Design x Nature Competition 2014 in Canada. The designs will be featured on future press materials and blog by Design x Nature. EXHIBITION: Designs by Wendy W Fok took over the entire W46th and Broadway billboard in Times Square, in New York, as part of a larger art exhibition on the 24th of July, between 8-9pm, with events extending to 11pm. Be sure to join if you are around the NYC area. Made possible by the See Me team and Times Square Arts, courtesy of the W Hotel Times Square. PUBLICATION: Wendy W Fok‘s recent contribution, a chapter on “Integrated Design Modeling – Explorative Design Modeling”, to the new book Building Information Modeling: BIM in Current and Future Practice, edited by Douglas Noble and Karen Kensek, has been published (Wiley) and available for purchase. Fok’s chapter includes interviews and case-studies on projects by Diller Scofidio+Renfro, Greg Lynn FORM, Coop-Himmelblau, Asymptote, Gehry Technologies, Prenova, among others. WORKSHOP: Wendy W Fok of WE-DESIGNS, sponsored by Solidoodle, will be giving a 3D printing workshop at the Museum of Art and Design (MAD) in New York, on June 1st between 2pm to 5pm. This will be a family-friendly event, and the closing workshop event for the Out of Hand Exhibition at MAD. Bring your 6-year-olds and above. LECTURE: Wendy W Fok gave a short presentation of her doctoral research at the CAADRIA 2014 “Rethinking Comprehensive Design: Speculative Counterculture” Conference, in Kyoto, Japan. INSTALLATION: Our public art, Corporeal Geometrix (CGX), for the ARTS First festival was successfully on display at the Harvard Yard, in Cambridge, MA. Click here to view at the video short, via Vimeo, that we put together on the installation process, and interactions with the piece by the community. Music by James Lealand – DJ Roo “Deeper Underground”. The installation was located at the Harvard Yard, between May 1 to 5, 2014, in Cambridge, MA. FINALIST: Harvard i-Lab has announced that a project venture, where Wendy W Fok is leading the design and product development, has been selected as one of the six finalists for the 2014 Dean’s Design Challenge. The product seeks to be the global leader in innovative building components and sustainable materials in the developing world. PRESS: A project venture, where Wendy W Fok is leading the design and product development, has featured on the Harvard Gazette on March 19, 2014, as one of six finalists for the Harvard Dean’s Design Challenge. EXHIBITION: Two our projects are exhibited as part of the Annual Exhibition for the American Institute of Architects Center for Emerging Professionals, in Washington DC until 30 April, 2014. FINALIST: Our team has been shortlisted as a finalist for the Dawntown Miami Design/Build Competition 2014. We are 1 of the 15 teams (out of over 200) to proceed into Stage 2. ACADEMIA: Wendy W Fok will be 1 of 20 Teaching Fellows teaching CopyrightX at the Harvard Law School this Spring 2014 semester, under the guidance of Prof William “Terry” Fisher. WORKSHOP: WE MAKE NEW YORK, a project bid by Wendy W Fok, Jenny Chow, Evelyn Tilney, and consultation with Jung Ahn, for the Times Square Transformation was shortlisted. The project was made possible by the Times Square Alliance for the Arts, New York Department of Design and Construction, and the Public Art Program of the Times Square Alliance. PRESENTATION: AIA Texas Society of Architects invites Prof Wendy W Fok to lecture the development of her research, at the TxA Interactive Session 3: Cooperative Fabrications., in Fort Worth, TX. TxA Interactive continues into its third session, exploring research from across the world on how innovations in digital technology are affecting architecture. AWARD: Wendy W Fok is one of the winners of the ADC (Art Director’s Club) Young Guns 11 (30 under 30ish) Awards, presented in New York on 8th of November, 2013. EXHIBITION: ACADIA 2013 has accepted “VITREOUS” a student-run / crowd-sourcing collaborative project lead by Prof Wendy W Fok, as one of the six projects to be featured at the ACADIA 2013 Conference at the University of Waterloo – 2013 Co-Chairs are Philip Beesley / Omar Khan / Michael Stacey – between October 21 to 24, 2013, in Buffalo, Ontario. INSTALLATION: Led by Design Partners Jung Ahn and Wendy W Fok, WE-DESIGNS is invited to design “Neological Mash-up” a 3D printed bar concept for the INSIDE festival of the WAF (World Architecture Festival) Event in Singapore, between 2 – 4 October, 2013, at the Marina Bay Sands, in Singapore. PRESENTATION: Design Partners Jung Ahn and Wendy W Fok of WE-DESIGNS, will be speaking at the INSIDE Festival co-hosted by the WAF (World Architecture Festival) at the Marina Bay Sands, in Singapore, on the 2nd of October, 2013. EXHIBITION: Part of the Beijing Design Week, Wendy W Fok is invited to exhibit as part of the DADA2013 Series of Events “Digital Infiltration” – International Conference on Digital Architecture. The exhibition opening is held on September 28~29, 2013, at the Beijing D751 Park, with a parallel event at Tsinghua University, Beijing. EXHIBITION: Kadri Kerge & Maris Kerge Architectural Installation NORTHERN LIGHTS part of New York Festival Of Estonian Contemporary Culture will be presented at Scandinavian House on Saturday, September 28 from 7pm to 10pm. WORKSHOP: ‘Digital Workshop in China’, a book that is part of the latest series of bilingual publications edited by Neil Leach and Philip Yuan (published by Tongji University Press), features the latest design works and workshops tutored by Wendy W Fok. PRESENTATION: Prof Wendy W Fok presenting her research and projects at the SIM (Sustainable Intelligent Manufacturing) International Conference on the 27th and 28th of June, 2013., in Lisbon, Portugal. PUBLICATION: Wendy W Fok published in “Fresh Punches” by suckerPUNCH, a catalogue for LOT & suckerPUNCH’s “Fresh Punches” exhibition. Available on Amazon. WORKSHOP: Register Now: WORKSHOP: 3D PRINTING PROTOTYPING COURSE in Paris, France, on 21st of June, 2013. EXHIBITION: Work-in-progress research, DIGITAL NOVELTY – CRYSTALLISED GEOMETRICS (2013), by Wendy W Fok, will be exhibited for an Open Studio viewing on the 20th of June, 2013 between 17H to 22H, at the Cité internationale des arts Paris. PRESENTATION: Wendy W Fok presents a paper and project at CAADRIA 2013 – Open Systems, in Singapore. PRESS: La Technologie Culturelle d’Objet is featured on The Creators Project (VICE/Intel). AWARD: Wendy W Fok is awarded a design residency at the Cité internationale des arts Paris. The Open Studio Exhibition is on the 20th of June between 17H – 22H., in Paris, France. AWARD: Wendy W Fok is awarded “Small Grants Program, 2012-2013” (Academic Grant) to continue to fund her academic research on digital technologies applied to computational design in architecture. PRESENTATION / EXHIBITION: Kadri Kerge / Wendy W Fok / Jose Aguilar / Ivan Cheung project on “Maribor 2112ai – Urban Stratification” invited for the 13th La Biennale di Venezia, at the Slovenia Pavilion., in Venice, Italy. ACADEMIA: Prof Thomas Fischer appoints Urvi Sheth & Wendy W Fok as Editors of International Journal of Architectural Computing (IJAC) for the upcoming Special Edition issue–this issue will also include recent CAADRIA 2012 papers. EXHIBITION: Completed: MoCA (Museum of Contemporary Arts – Shanghai) Terrace Installation Collaboration/ By: AAC Institution, Alvin Huang, Wendy W Fok, Neil Leach – Opening Party 3rd August. ACADEMIA: Wendy W Fok is appointed by Prof Thomas Fischer to be part of the Special Edition Editors of the IJAC (International Journal of Architectural Computing) Magazine. PRESENTATION: Wendy W Fok lecture on “Cross Pollination of Ideas: Design Experimentation / Fabrication” at CAUP Tongji University Main Auditorium: 17 July 2012 @ 6:30pm — at Tongji University. ACADEMIA: Wendy W Fok and William Truitt leads the new Pan-Asian Program, held in Hong Kong and Shanghai, in its inaugural year with 13 UH students. EXHIBITION: DigitalFUTURE Shanghai features Wendy W Fok of WE-DESIGNS as one of the “Fabricating the Future” designers. EXHIBITION: Wendy W Fok at the Opening Night of the “Come Up To My Room 2012“. GEO-COGNITION (installation) is one of the 100 design pieces selected by Design Line and AZURE magazine as a featured installation, and also will be featured on CBC TV in Canada. PRESS: Wendy W Fok is featured on the Come Up To My Room 2012 website, promoting the up-coming installation as one of the 11 selected Artists, as part of the Toronto International Design Festival 2012. PRESENTATION: Toronto #10: WE-DESIGNS (Jenny Chow and Wendy W Fok) are invited to present at the Pecha Kucha Night in Toronto at Harbourfront Centre, 235 Queens Quay West on the 30 September 2011 @ 8pm. PRESS: (RE)Configured Assemblage, by WE-DESIGNS and XP& Architecture, featured on BLANK (PT) magazine,archDaily (US), and e-architects (UK). EXHIBITION: DigitalFUTURE – Shanghai Invitation: The work of WE-DESIGNS and CUHK (Summer Relational Modularity Studio) will be exhibited at DigitalFUTURE, curated by Neil Leach & Philip Yuan, alongside other pioneering international design practices, including: Zaha Hadid Architects, UN Studio, Greg Lynn FORM, SPAN, Evan Douglas Studio, Aranda/Lasch, among many others. EXHIBITION: WE-DESIGNS featured at the BCA Show 2011 (Barnard – Columbia Alumni Show 2011), part of the Progress | Process Exhibition — featuring a few selected Alums of the Barnard – Columbia Architecture Program. DESIGN: Max Broby of WE-DESIGNS (UK), goes on-site with the Chelsea Restaurant (Client: Poilâne Boulangerie) in London. The restaurant is a Danish All-Star collaboration directed and designed with BrobyDNA with Danish project partners: Dinesen, Gubi, Kvadrat and Republic of Fritz Hansen. AWARD: Wendy W Fok of WE-DESIGNS selected for the Perspective 40 under 40: Design Stars of Tomorrow Award, for the Category of – Architecture/Interiors. Special Thanks to Bjarke Ingels, BIG, and Grace Lau, Vice-Chairman of the HKDA, for the support. ACADEMIA: Sue Biolsi of WE-DESIGNS will be a Teaching Assistant for the Rice University School of Architecture LAUNCH Summer Architecture Program – a program in its inaugural year. ACADEMIA: Sue Biolsi of WE-DESIGNS is a recipient of the John T. Mitchell Travelling Fellowship. The research is on the topic of ‘architecture and diplomacy’, with destinations including researching in seoul, korea and tokyo, japan. AWARD: WE-DESIGNS announced as one of twenty “Emerging Canadian Design Practices” participants for the Twenty+Change 03 publication and exhibition, in Canada. DESIGN: Martin Xavier Broby of WE-DESIGNS (UK), completes construction and design of “TokyoFixed Bike Shop” in Soho, London. Images to come. INTERACTIVE: Launch of (C)ODE-(C)OLLECTIVE : Rhino GH + Digital Script + Code Collective: a collection forum for Grasshopper, Rhino, Parametric Modeling, and other digital design tools, which pose as an educational and developing archive site to formulate the critical utility of digital tools. PRESS: WE-DESIGNS is published in CONCEPT magazine, on a 6-pg spread, of our “UP – Urban Tower Transformation” Project. DESIGN: Kris Kohl of WE-DESIGNS, Design Manager for the Boston-based Edward. M. Kennedy Institute for the United States Senate, has recently made public the Institute’s schematic building renderings. Designed by Rafael Vinoly Architects, the Institute will contain interactive exhibits and a full-scale representation of the US Senate Chamber, for immersive experiential learning. DESIGN / EXHIBITION: Wendy W Fok of WE-DESIGNS, has successfully presented the tea/coffee/breakfast prototype 「Jointness」 set to Alberto Alessi, at the ALESSI HQ in Omegna, Italy. The design will be part of the ALESSI MUTANTS Exhibition for the 12th La Biennale di Venezia. Jury Members included: Hani Rashid, Hernan Alonso Diaz, Florencia Pita, Tom Kovac, Reiner Zeittl, Gloria Barcellini, Alberto Alessi and his Communications/Marketing Team. AWARD: Wendy W Fok of WE-DESIGNS and Joana Sobral, representing team “4-Scales”, has been awarded as Honorable Mentions for the Paris project: At The Crossroads, part of the Converging Territories Project for the EU. ACADEMIA: Wendy W Fok is invited to be part of the Final Review for the Chinese University of Hong Kong, Dean Puay-Peng Ho’s Masters I Studio. AWARD: Wendy W Fok of WE-DESIGNS, is commissioned to design a piece for the “Looking Forward- The Future Generation” section for “Hong Kong: Creative Ecologies” Travelling Art Exhibition Tour 2010. PRESS: Hays Report on Salaries within the Architecture/Built/Construction Industry in Hong Kong/Singapore/Japan. JOBS: We are currently recruiting creative individuals internationally to work offsite. These individuals must be team oriented, be able to work individually, who are pro-active, able to work under stress/crunch, detailed orientated, and has a high-quality of time management. MISSION: Conceived in 2003, and officially established as a collective in 2008, WE-DESIGNS is a multi-disciplinary creative practice. As a developmental and collaborative team of creatives (architectural + design) individuals, all our designs are established within the international standard, detailed orientated, quality within multiple design functions, but not limited to: creative strategy, interactive design, architecture, urban planning, and research-based design schemes.